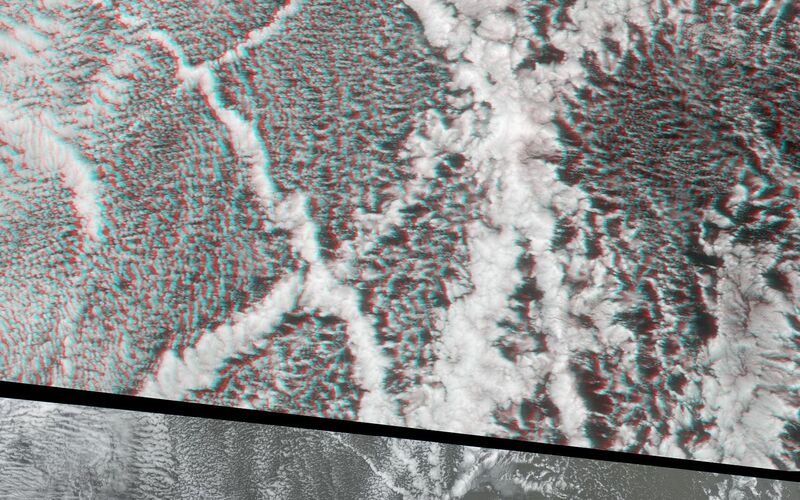 An example of interactions between aerosols and clouds in the marine atmosphere is apparent in this cloud signature, visible as bands of puffy cloud embedded in a layer of stratocumulus. 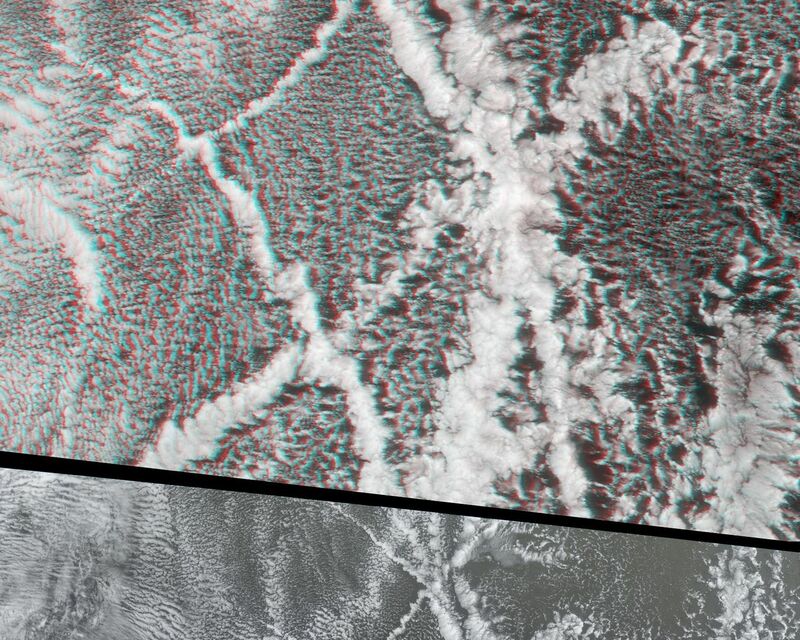 These striking linear patterns are known as "ship tracks," and are produced when fine particles (also called aerosols) from the ships' exhaust float into a moist layer of atmosphere. The particles become cloud condensation nuclei (CCN), which may either produce new cloud particles where none existed before, or may attract water from existing cloud particles, creating a brighter cloud composed of smaller droplets. These images are centered over the Pacific Ocean, about 1600 kilometers west of San Francisco, and were captured by the Multi-angle Imaging SpectroRadiometer on July 18, 2001 during Terra orbit 8424. The top panel features a stereo anaglyph view and represents an area of about 400 kilometers x 465 kilometers. The panel below it is a natural-color nadir (vertical) view of a somewhat longer section about 935 kilometers in extent. The stereo anaglyph enables a three-dimensional visualization of the vertical structure of the condensation trails. It was created using a combination of red band data from MISR's 70-degree forward and 70-degree backward-viewing cameras. The images have been oriented with north at the left and west at the bottom to facilitate stereo viewing. In order to observe the 3-D effect of the stereo anaglyph, red/blue glasses should be used with the red filter placed over your left eye. Information on ordering glasses can be found here. 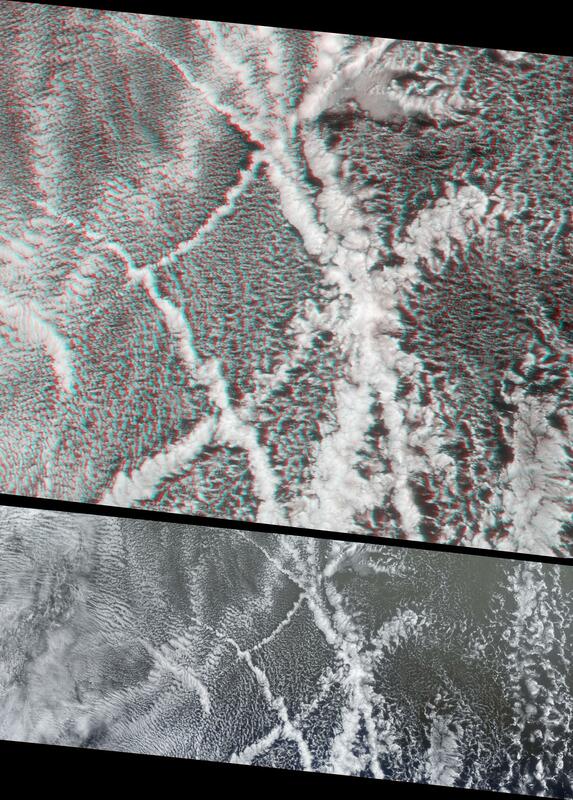 Ship tracks are important examples of aerosol-cloud interactions. They are studied to help understand how human-made particles can affect the environment. 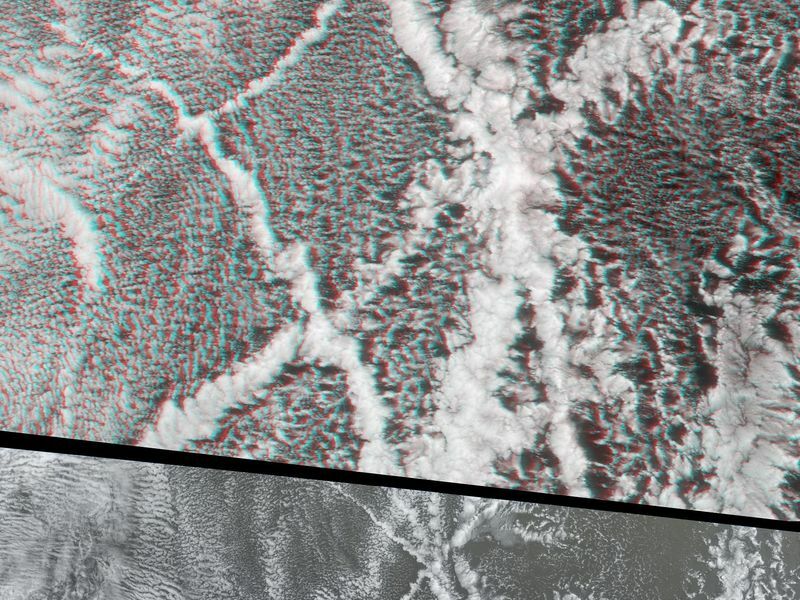 Like contrails produced by aircraft, their impact on regional and global climate is not yet known, but satellite observations of these phenomena are providing new information.